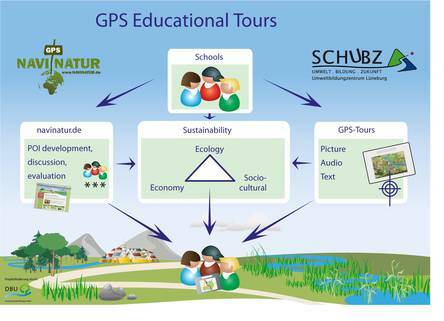 In contrast to conventional GPS tours (so called "geocaching") at NaviNatur the pupils create their own "Points of Interest" (POI) as GPS educational points in the context of sustainable development. For this purpose, they develop interesting questions based on the real experience in nature. To do this, they create own information with pictures and audio features. Afterwards, these will be uploaded to GPS-devices. Thereby the pupils do a particular contribution to the public awareness of sustainable development in their region, self-organized and down to earth. And who would know better how to excite other students for the concept of sustainable development than the pupils themselves? At NaviNatur the pupils concentrate on interdisciplinary topics based on Biosphere Reserves or other protected areas as landscapes for sustainable development. Equipped with GPS devices, digital cameras and recording devices they do excursions on foot or bicycle to explore their environment. Thereby they seek and explore places where the topics can be illustrated particularly well. They feed the GPS devices with information of the given habitat and navigate themselves to the relevant Points of Interests. The contents are centred around ecological, economic, social and cultural aspects of their region.